There are quite a few geosites in Spain. However, the Gypsum Karst Caves of Sorbas ('Cuevas de Sorbas') is one of the most spectacular karst topography, apart from the worlds most impressive geode found in Pulpí. 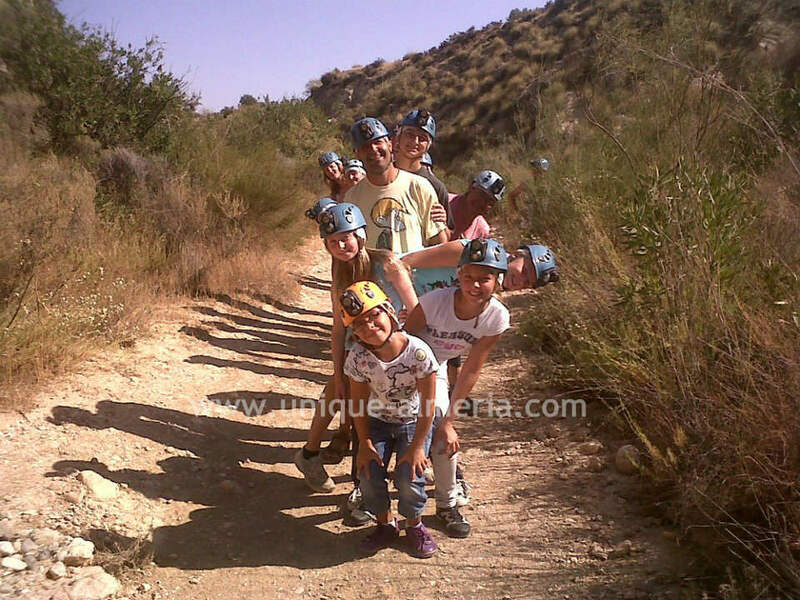 It is located in the South of 'Sorbas', a charming little town in the province of Almeria, between ‘Tabernas’ and ‘Los Gallardos’. This area is famous for it's cave tunnels of more than 50 km. it's marvelous underground world is really worth a visit, provided you do not suffer from claustrophobia…, since it is almost a journey to the centre of the Earth. But what exactly is this Karst topography, namely Gypsum Karst of Sorbas? It is a set of caves that were formed by the combined action of water. On the one hand, due to erosion of river waters and on the other hand by the dissolution that occurs on some rocks, in this case: Karst. Gypsum is a mineral with a fairly rapid dissolution in water. Because of this speedy dissolution, its degradation is also quite fast and this is the reason why there are very few Gypsum Karsts in the world. Most of these geosites are highly degraded. However, in Almeria, because there is very little rain, this process is not that fast and therefore it is one of the best preserved Gypsum Karst topography in the world. Ready for a journey to the centre of Earth? Bear in mind that down there, temperature drops, so make sure to bring warm and appropriate clothing. Also, sport shoes are absolutely necessary, since you may expect considerable climbing and crawling. You may want to arrive early, so you have time to stroll around the picturesque town Sorbas, which I recommend that you visit. Sorbas seems to drop from a cliff and nestles above the river ‘Aguas’. 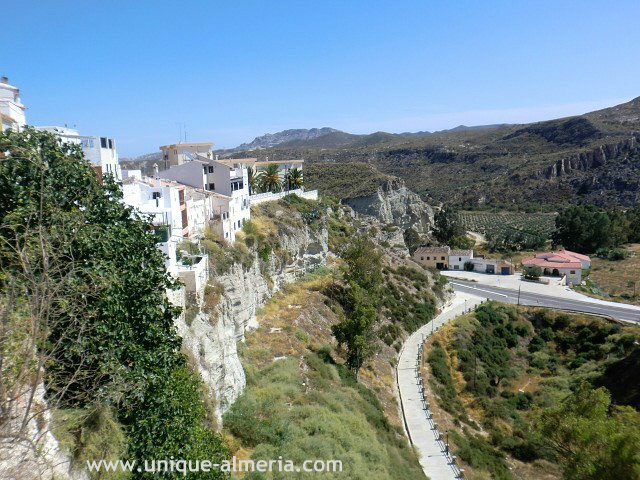 It is also known as "the little ‘Cuenca’”, because of the houses clinging on the rocks (just like in ‘Cuenca’ another famous Spanish town). Sorbas is of roman origin and it's name means "sand pot" due to the pottery people used to make and continue making. - An overall, which is essential because you will often lean against a wall and scramble, crouch and crawl underneath rocks. - A helmet, which is certainly not a simple element of security given to you just in case. Nope! It is quite useful, because more than once you will closely pass by some rocks, thumping your head while trying to get up. - A light on the helmet, because there are caves where the only light will be that on your helmet. - Of course you also will be given some waterproof boots, climbing harnesses and carabiners, since there is a rappel of some 8 metres. Enjoy your journey to the centre of Earth! Now you are passing through a desert-like landscape with dusty roads by your own car, but accompanied by the specialized guide. You arrive at a point where you cannot continue by car. – It is time to get dressed and walk to the cave entrance. You are about to enter into one of the world's most impressive geosites! Can you see the huge cave entrance over there? – Sorry, but this is the access for those who booked the 'Combined Route'. - The entrance for the 'Technical Route' you have chosen is that crack in the floor in front of you! It looks like those cracks produced by an earthquake, doesn’t it? …not much more than a meter wide and an estimated two and a half meters high. – Scared? Thinking you won’t be able to enter here? You carefully slip into the crack until you feel the ground under your feet. Well done! – Now you begin to walk about 250 meters through the crack (certainly not suitable for an obese person, because it is full of curves and you have to help yourself with hands and body). The tour is getting very exciting. You are walking close to each other, because it is very dark and the light of your helmet isn’t sufficient so you need the light of your companions. There are several small rooms and your guide suggests that you to switch off your lights. What a sensation! – Now you reach a rappel of approximately 8 metres in length. After a short explanation by your tour guide, you manage to get down easily. But, what a surprise - You arrive at a gallery full of very large crystals of gypsum and see them reflected in the light. - Spectacular! 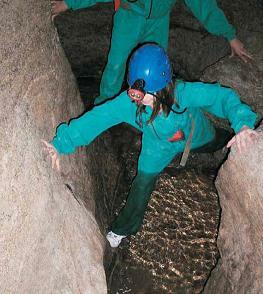 - The cave is full of large stalactites, stalagmites, canyons and geodes. 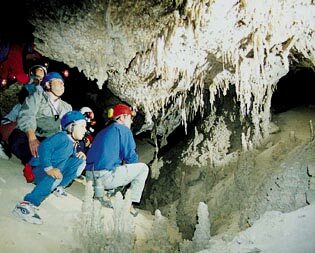 Some of the largest geodes have been found in these caves, but the world’s largest geode was found in Pulpí (Almeria) , probably one of the world’s most important geosites, located in the province of Almeria. Finally you come out of the cave, a little tired but relaxed. There is still a good walk back to the car, but it was a great experience wasn’t it?